According to a survey report from the American Psychological Association released last month, more than half of Americans consider the present the lowest point in US history they can remember. This conclusion came from people of every generation including those who lived through Word War II and Vietnam, the Cuban Missile Crises and the attacks on September 11. The purpose of the survey was to measure stress in America. If we’re already stressed, how are we going to handle the upcoming holidays, which can be stressful on their own? For many people, the holidays also bring feelings of sadness and depression. And some are affected by the shortened days and dearth of daylight at this time of the year. Most of us need some help to get through it. Don’t worry. There are many steps you can take to help manage stress, and the anxiety and depression that can come with it. I’ll tell you more about that later. But first, let’s consider one reason the holidays are so stressful to start out with. According to an article from Harvard, it’s a brain thing. 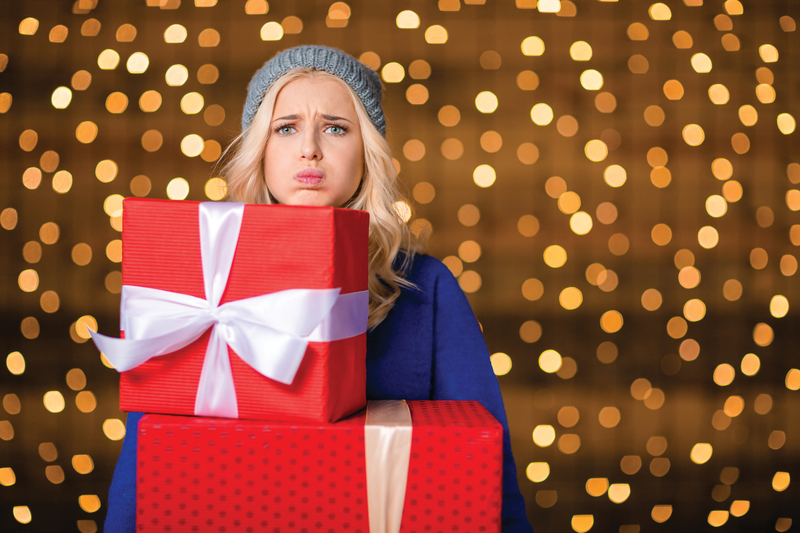 The article’s author noted another survey whose respondents reported financial demands, dealing with family and maintaining personal health habits as their main holiday stressors. Responding to challenges like these requires shifting our cognitive strategies, and that’s where brain function comes in, specifically cognitive function. Cognitive functioning is a type of executive functioning, which is responsible for getting things done. This type of functioning is done by the frontal lobe of the brain. The skills that are part of cognitive functioning include managing time, being attentive, switching focus, planning and organizing, and remembering details. These skills are in very high demand during the holidays. People who manage holiday stress the best are those who have “cognitive flexibility.” They are able to shift their attention between tasks and rapidly adapt to changing environments. Unfortunately, that flexibility can be difficult to achieve for most people. For those of us who are less flexible and need more help managing stress, there are many resources with coping strategies on the Internet. I’ve chosen these three to garner a few tips to note.3,4,5 There are more tips in these articles and elsewhere. Be realistic and keep things in perspective. We often set high expectations for the holidays, but rarely do the actually experiences match our images. Accept that the holidays don’t have to be perfect, and remember what the season is really about. You don’t have to buy extravagant gifts to have a happy holiday. Take time for yourself. You’ll be running around trying to make the holidays fun for everyone else, but take a few minutes to take a breath and take care of yourself. Even if it’s just 15 minutes alone, it will help recharge you. Do some yoga if you can or just some deep breathing. Don’t neglect your healthy habits. Just because it’s the holidays, don’t give up your healthy diet or your exercise routine. Try to get at least eight hours of good sleep every night. These behaviors are natural stress busters, so try not to abandon them just because you’re busy with other things. Learn to say “no.” For most of us, it’s impossible to make it to every party and do every activity scheduled around the holidays, and still fit in work. It’s okay if you can’t make it to someone’s event, and don’t feel guilty about it. They’ll understand how tightly your time is stretched. They’re going through the same thing! Be grateful. The thoughts around the holidays generally center on “what I want” and “who is not here.” Instead, try changing your focus and thinking about “what I have” and “who is with me.” Recent research found that gratitude led to lower levels of stress and depression. These are just a few ideas for managing the holidays. If you still suffer after taking steps to reduce stress, especially if you feel anxious or depressed, see a qualified therapist. Talking to a therapist can help you work through your struggle and feel better. The therapist can also give you additional strategies for your battle against stress.